GoldFynch is flexible! Upgrade or downgrade your case plan as needed. 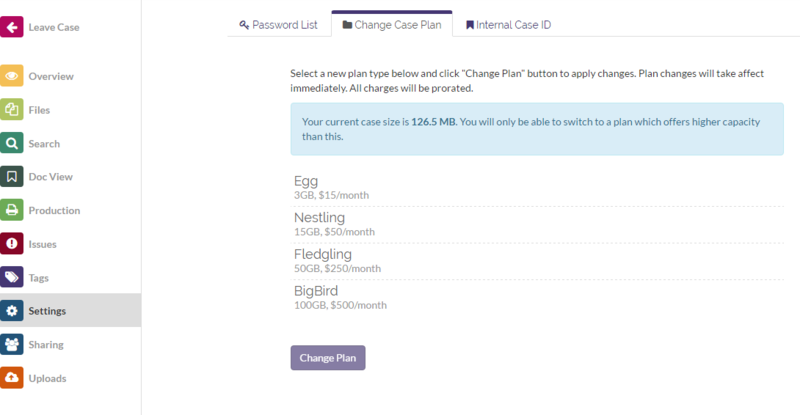 Choose from 4 paid plans: Egg (3 GB), Nestling (15 GB), Fledgling (50 GB), and (new)BigBird (100 GB); it’s easy to move from one to the other. You’ve reached your plan’s storage limit. You don’t need all the storage your plan provides. You don’t need faster processing anymore. Billing is prorated, so pay only for time on a plan till the upgrade/downgrade. Changing plans is quick and easy. Step 2: Click the ‘Settings’ button in the left menu. Step 3: Click the ‘Change Case Plan’ tab. Step 4: Click on the plan you want. Don’t worry, GoldFynch only displays valid options for selection and you can always upgrade or downgrade later.